I’m a practical person in most respects, so I tend to give gifts that are useful or inexpensive modestly priced. I enjoy taking a humble present and wrapping it in gorgeous paper with a lovely fabric bow. While some might see this as false advertising, it’s really just my way of adding to the fun. I’ve noticed that most of us like surprises, even little ones, and the trimmings add to the suspense. I suspect it’s also a sort of reverse twist on a phenomenon that seems at least a little bit regrettable: too often, the most precious and priceless aspects of our lives are camouflaged, hiding in plain sight behind unremarkable appearances. Have you ever injured your thumb or foot, and found yourself realizing how much you have taken it for granted? It happens with many blessings, I think. Whether it’s a really comfortable pair of shoes, a sturdy and reliable appliance, or an old car that never fails to get us to our destination, we are surrounded every day by things that make our lives easier and more pleasant– things we scarcely ever notice until they are no longer available to us. Even more truly, we are blessed with aspects of the natural world that require only our attention to bring us joy. A quick walk to the mailbox can show us a tiny wildflower or a spider’s intricate web, sparkling with dew. Ordinary animals, both indoors and out, warm our hearts and put smiles on our faces. And some of the most endearing and fascinating people are the least flashy or glamorous. There is almost always more to anything than meets the eye at first glance. What will we see beneath the surface today? So much is there, waiting for us to notice and celebrate. One of the reasons I like going on holiday is that it makes me appreciate home – simple food, a comfortable bed, harvesting food from the garden and the affection of our two dogs. I like to see the world, but home is special. I so agree! I’ve often thought that the primary reason for travel is to open our eyes to our own homes. Something I like to consider when I travel is that no matter how exotic or exciting a new place may seem, to the people who live there, it’s home. It’s so fun to know that someone else’s everyday world is so strange and new to me, and of course, vice-versa. Barb, I’m happy to know you are enjoying your neighborhood. I love imagining you walking around taking photos of butterflies. The other day I was telling someone about putting my camera on “ugly override” and it brought back so many memories of our hysterical laughter. Hope your autumn is full of beauty! Such a delightful post! I love this painting! 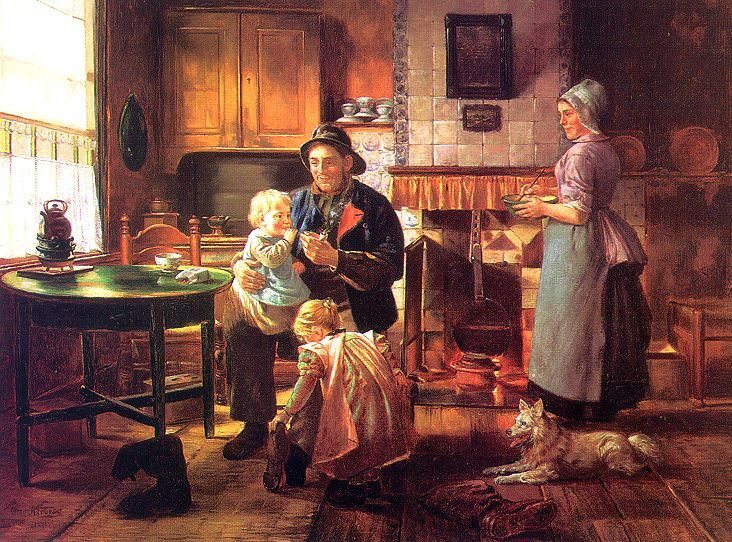 It invites the viewer to envision many scenarios of everyday happiness in that room. It is fascinating to me that I can walk out the front door to attend to something, not much time has passed, I walk back the same path & a spider has already spun a web for me to walk through. I love the sky, clouds, flowers, birds, bees & on & on. I love to receive a smile from a stranger & return it with joy. A gentle touch, a big hug, simple but profound ways to express life to one another. Thank you for sharing, so we can share & then think about our world as GOOD! Mary Ann, thanks for sharing these glimpses of the many wonderful and beautiful things we enjoy every day. Being around you always made it easy for me to feel happy, positive and hopeful. That’s quite a compliment, and it’s 100% true and from the heart. Sending much love your way!!! What an accolade! You lift me up! I want to spread the joy of which you speak everyday! Your encouragement makes me overflow with praise to our Heavenly Father, because He brought us together! Mary Ann, we clicked from the moment we met, and the rest, as they say, is history…. 😀 ❤ I agree that our meeting was no coincidence. Hope you are having a wonderful week. Oh, how true! Whether I’ve been out running around for a day, or on a long vacation, I’m always so happy to see HOME. Hope you have a wonderful weekend ahead. Thank you, Sheila. One of the things I love best about correspondence is choosing from such a wonderful variety of cards, pens, inks, stamps and stickers. Of course, being loquacious naturally means that a lot of detail ends up in my chatter (whether aloud or on paper) so I’m fortunate that you have not the patience to endure it, but the grace to say kind things about it. You are a continual source of encouragement for me, and I’m so happy you are here! Willow Tree this weekend? Our weather here has been GORGEOUS. Race you to the Verandah! Sheila, I am excited for you! I hope the entire Vann Clan has a fabulous time in beautiful Santa Barbara. It would be hard NOT to have a great time there. Bon Voyage and many traveling mercies to you all!! I loved this post. The painting is inspiring as you were to me today. Yes, when something is broken, we really learn how much we depend on it. We take so much for granted and reduce it’s value because it’s always there. Today will be another of gratitude. Especially for the wonderful people who remind us of it’s importance. Thank you Marlene. I think we are kindred spirits when it comes to seeing how much beauty and poetry lies in everyday things. Thanks for being here, and for your encouragement! When I was a child, my mom had a list on her bulletin board that said: Things that Money Can’t Buy. It included sunshine on your birthday, a warm puppy crawling into your lap, a hug and other things like this that I’ve since forgotten. It’s often true, that the best gifts are in front of us all along. Today I’m missing my mobility, my carefree ability to move through space. I’ve been able to put one foot in front of the other for 56 years. It will be awhile before I can do that again. It’s making me appreciate all the more the rest of my good health. Alys, today I will be walking for both of us, thinking of you and looking forward to the day you are back in top form. I count you among the many blessings money could never buy. Thanks for being here with us! Awww. I love that, Julia. Thank you. Likewise. So….what did we see on our walk today? Alys, to be honest, what we saw on our walk the day you wrote this comment was mostly the inside of the airport terminal at Atlanta. One can walk for a pretty good distance there by avoiding the “plane train” and moving sidewalks. They have lots of nice African art, and a well composed history exhibit among the interesting galleries that line the pathways for those who choose to walk. So it wasn’t quite as nice as being outdoors, but still enjoyable. 🙂 Especially with you along. Yes it is amazing the mileage you can put in at the larger airports. I’m glad you found an interesting exhibit to enjoy along the way. Are you flying to Atlanta every week now? How long is your flight? Alys, not quite that often — more like every 2-3 weeks since Daddy died. But I expect that will be lessening from here on in. The flight times aren’t bad at all (less than two hours including runway time) so I usually make very quick trips, since Jeff has to take time off to be there for Matt while I am gone. One good thing about living in the DC area is that there are always lots of options in terms of flight schedules. When we lived in Hawaii or even on the central coast of California, it could take an entire day (sometimes more) to get home. So I’m thankful that we live closer now. I’m glad the frequency of the trips is decreasing, especially as the days shorten and the weather worsens. It’s good to hear that you can get there in a few hours though. DC is quite the hub. Yes, that’s one thing we like about living here part time. I wouldn’t want to live here full time, though. I have so much to be thankful for and I wish to hell I could feel it this morning. Oh Harry, I was so sorry to read that you were having a bad time. I hope this finds you feeling better. I am sending up a prayer that God will grant you the peace that passes understanding — Daddy said often, in recent years, that this was the prayer that never failed him. It’s cold comfort, I know, but those of us who read your words here and understand how you feel, are sharing your exhaustion and sending you warm wishes for better days ahead. Hang in there! These days I am practising gratitude regularly. Your blog has often reminded me of the blessing called the normal day. Today was our annual Arts Fest and it was amazing to see the students on the stage with their marvellous performances, esp the group dances. The teachers did their best – they are my strength. I enjoyed every moment of the day though by the end of it we were all exhausted. These are the special days of my life as a teacher. Hello Bindu, it’s so nice to see you here again! I imagine the special school days such as the ones you describe are the inspiration that keeps so many teachers going. Speaking as a student, my fondest memories of school center around those festive times. For most of us, school productions are the closest we will ever get to being artists and performing before an audience, so the memories are precious. Thanks for sharing a bit of that joy here with us today. We just had a special school day last week: a “mini-marathon” with the 100-Mile Club (I’m one of the advisors). There was some miscommunication (I assumed that the PTA was handling all aspects), the other teachers weren’t notified ahead of time, but they let their kids out to run a mile, and boy did they run. I could barely contain them long enough to get instructions on taking the water cups! The day started out with the potential for disaster, but turned out to be a lot of fun (I got a new student that morning, I wonder what she thought of it all). Rene, reading about this made me smile — thanks for telling me about it. It brings back some fun memories from my own school years. Teachers are an amazing lot, when you get right down to it. They are continually turning the potential for disaster into a lot of fun. The teachers keep the kids safe and the kids keep the teachers young — at least most of the time. 😀 Your new student probably felt less self-conscious and more at home with such distractions. I used to love this time of year best during my own school years, and also those of our sons. The excitement of the holidays add such a wonderful touch to everyone’s spirits. Hope your December is full of the same kinds of fun activities. I love that song! We sang it in high school chorus. There was a boy from Cuba who sang the solo, and he also told us what the words meant and how to pronounce them correctly. Were you the one who linked me to this video of the Monkees singing it? Mickey sings the solo in the video. Hopefully you have some bilingual students who can help you. Rene, I wish I could be there to hear y’all sing it! I’ll think of you now whenever I hear that song.